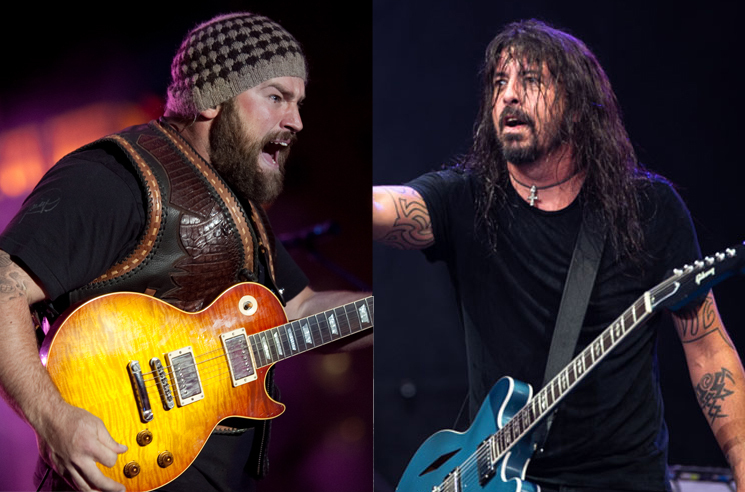 Watch Dave Grohl and Zac Brown Band Cover Metallica's "Enter Sandman"
Having recently covered a Pantera classic with members of Slipknot and Anthrax, Dave Grohl joined Zac Brown Band to take on another heavy favourite from metal icons Metallica. Grohl joined Brown and co. onstage at a Pandora event in Atlanta last night (January 31) to cover the thrash pioneers' beloved "Enter Sandman." Brown himself was primed for the occasion, playing a Gibson Explorer in the spirit of James Hetfield, while Kirk Hammett's solo section was covered by fiddler Jimmy De Martini (complete with wah pedal). You can watch the performance in the player below. The universe now owes us a Metallica cover of "Chicken Fried" for balance. Grohl served as producer for Zac Brown Band's 2013 EP The Grohl Sessions, Vol. 1.